The American Holistic Veterinary Medical Association (AHVMA) became the first national veterinary organization to support efforts by Kansas State Veterinary Diagnostic Laboratory (KSVDL) to improve rabies testing with a modified screening test to determine if veterinary patients need to receive rabies booster vaccinations to maintain protective immunity. The AHVMA and its members have long expressed concern over animal vaccination practices. While vaccinations provide important protection against a wide number of serious diseases, they can also cause adverse effects ranging from minor discomfort, autoimmune disorders and even death on rare occasions. Recent research at the Rabies Challenge Fund suggests immunity from rabies vaccination lasts much longer than the usual one to three year interval required by current laws. This study added significant evidence that we may be over vaccinating for rabies in our pet population. Public health officials have expressed concern that reducing vaccination for rabies could increase the incidence of this deadly disease. To date legislatures and public health agencies have resisted changing rabies vaccination laws to reflect current knowledge about rabies vaccine duration of protection. Rabies vaccinations can be associated with a number of significant, well documented adverse effects. These include localized swelling and pain, fever, chronic hair loss, ulcerative dermatitis, encephalitis, vasculitis, seizures, vaccine related cancer and anaphylactic shock. Pet guardians whose animals have suffered such illness are very concerned about revaccination. If they fail to keep the vaccination current based upon current legal requirements, they may be penalized in several ways depending upon existing legal statutes. KSVDL recently announced the modification of the established rabies antibody test (Rapid Fluorescent Focus Inhibition Test) to rapidly screen immunity to rabies virus. Once properly vaccinated, such testing can be used to identify if the individual has an antibody level indicative of protection from rabies. If an animal undergoes testing and is found to have adequate protection, the AHVMA supports reform of public health laws that require automatic revaccination. Such booster vaccinations may not be medically necessary. This new testing procedure allows screening for continued rabies vaccine response. This allows veterinarians and pet guardians to effectively decide upon a path that reduces risks of an adverse effect for individual animals while protecting any public health concerns. • 92% gave rabies vaccinations. • 76% routinely offered titers for core vaccines after completion of the initial vaccine series. • 34% offered titers for rabies after completion of the initial 2-dose series. • 75% would measure rabies titers if the Compendium changes its stance to equate out-of-date rabies vaccine status the same way as they do animals current on rabies vaccines. It is the hope of both organizations that through cooperation and advancements in science we can illustrate our dedication to better health and safety for people and animals. As science advances we must update public policy to reflect our new understandings. This new testing is a great example of such cooperative efforts. If a person or animal is bitten by a dog, cat or ferret, the animal causing the bite should be observed for 10 days. If the animal remains healthy, then one can be assured that there was no rabies virus in the saliva at the time of the bite. Whether that observation occurs at home or at a clinic should not be determined by vaccine status. Remember also that even in areas where terrestrial rabies is not active, that rabies in bats is seen nationwide. A review of rabies challenge-studies indicates that there is a positive correlation between rabies virus neutralizing antibody (RVNA) titers and the level of protection after virus challenge. Pre-exposure vaccination coupled with a RVNA titer at or above 0.5 IU/mL indicates greater assurance of protection than does the animal’s current vaccination status alone. Because we may not know if an animal has been exposed to rabies virus, the KSU Rabies Lab recommends that rabies titers be done routinely for dogs and cats. A yearly rabies titer would provide information on the pet’s rabies immunity status to guide booster decisions that would provide the best protection from unknown exposures. The circulating rabies neutralizing antibody level does not last the lifetime of the pet. In vaccine trials, as the titer falls below 0.5 IU/ml the risk of contracting rabies after challenge goes up. Thus, when rabies titers drop below 0.5 IU/ml, giving a rabies booster is the prudent, safe decision. Significant post-rabies adverse reactions are an issue not only for dogs and cats, but also are of serious concern for horses, as they must be given rabies boosters annually. Many horses have incredibly high rabies blood antibody titers, and yet still must be revaccinated annually by law, and then can suffer a chronic disease state post-rabies vaccination. Neutralizing antibody is neutralizing antibody, no matter the species; the goal is to confirm success of the 0.5 IU/ml level in horses as well. The Rabies Challenge Fund research trials are approaching the 7th year. Co-Founders, Kris Christine and Dr. Jean Dodds, have raised private funding for these trials, which are being conducted by Drs. Ron Schultz and Laurie Larson, University of Wisconsin School of Veterinary Medicine. AHVMA is the mindful leader elevating the veterinary profession through innovation, education and advocacy of integrative medicine. 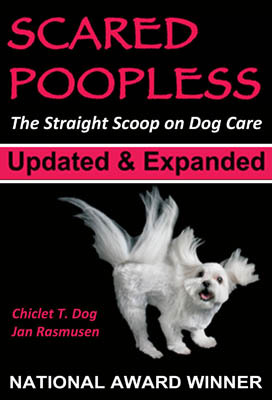 Jan Rasmusen is the national award-winning author of Scared Poopless: The Straight Scoop on Dog Care (winning Best Health Book and Best Pet Health Book). Scared Poopless has been updated and expanded for a 611-page e-book with 260 color photos – an Amazon Bestseller! Read it on tablets, computers or smartphones with the free Kindle app. All proceeds benefit dog causes. Check out our two other websites dedicated to dog health:truth4pets.org and dogs4dogs.com. Even where it’s not allowed, some vets (especially holistic vets) will help.